Luis Severino gets the call for the Yankees in the wild card game for the second straight year (Photo Credit: Bill Kostroun). Alright, so I didn’t nail my Wild Card pick last night. Today is a new day, and oh by the way, these two teams can hit. The same can’t be said for the Rockies and Cubs, who combined for three runs in 26 combined half-innings. The A’s are going with the trendy “opener” in Liam Hendriks, and even though I’m pulling for the A’s, I hope this strategy backfires, because I’m tired of it and don’t think it actually does anything other than mess with tradition and the notion that starting pitching isn’t important. Still, Bob Melvin is your runaway winner for Manager of the Year. But can his A’s pull off the stunner tonight? The A’s mash home runs, particularly on the road, so this isn’t nearly as lopsided as you’d think. But alas, the A’s are also reliant on the home run (not that the Yankees aren’t). The Bronx Bombers set a record with 266 longballs, and you can bet they’ll be salivating for a chance to impose more torture on Fernando Rodney in the late innings. Keep an eye on Luke Voit to have a big hit. He’s been on a tear and getting clutch hits since he arrived in the Bronx. Edge: Yankees. This is a moot point, because the A’s are just admitting that they don’t have a starter they trust for this game. 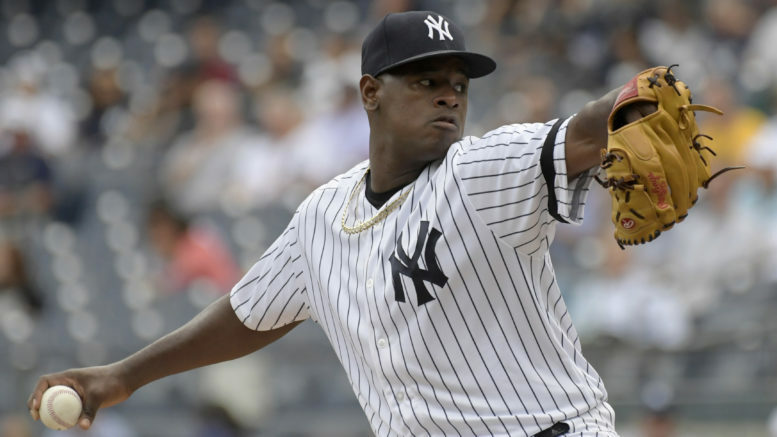 Luis Severino struggled down the stretch, but he is still the ace of this club and would love to atone for his miserable outing in last year’s wild card game against Minnesota. The hook will be short on Severino, so it could turn into a bullpen game on both sides anyway. But if Severino is on, look out. Edge: Yankees. The A’s must think highly of their bullpen considering they are asking it to get the bulk of the outs in this game. But it’s hard to top a unit featuring David Robertson, Chad Green, Dellin Betances, Zach Britton, and Aroldis Chapman. Tommy Kahnle isn’t too shabby either. The A’s counter with a glut of capable names in Lou Trivino, Jeurys Familia, and Fernando Rodney, with Blake Treinen having a Britton-esque-circa-2016 type of year at the closer spot. Still, Rodney has struggled against the big boys of the AL East and could be a liability. Green could be the wild card, as he was last year in saving the day. Edge: Yankees. As I stated above, Melvin is easily your AL Manager of the Year. Aaron Boone has acquitted himself nicely in his first year working with the stacked team he was given. Somehow, some way, Melvin has guided his team to 97 wins, and I don’t see them being intimidated by a Yankees team they split six regular-season games with. Edge: Athletics. All the pressure is on the Yankees in a year many people predicted them to win the World Series (including yours truly). Being at home helps, but they didn’t want to get into another wild card game. 100 wins was only good enough for finishing eight games back of Boston. Oakland has moxie and will relish the underdog role here. Edge: Athletics. I’d love to pick the A’s, but alas, this is 2018, and all the big dogs appear to be on a collision course, especially in the American League. If Severino is on, the Yankees will be just fine, but if he struggles, they will need late heroics. I have a strange feeling that someone in the A’s bullpen is going to have a major meltdown, and wouldn’t be shocked if it’s the seemingly-invincible Treinen. Prediction: Yankees 6, Athletics 5. Be the first to comment on "AL Wild Card Game: Will Opener Backfire?"